This week EA’s The Sims Social started it’s much anticipated open Beta on Facebook and I was there with the other 5 Million active users to try the new version of a classic game. This version of the Sims does not differ significantly from the main series, but there are a few things that aren’t there. The job system comes to mind first. You don’t look through the paper or the computer for a job. To earn simoleons, the equivalent of Sim cash, you accomplish certain talks around the house like writing a blog article or composing a song. This also means that you aren’t gone from the house for several hours a day and there’s no waking up for work at varying times of day, so you don’t have to bother with the alarm clock. While the overall gameplay is very similar to other The Sims titles, there are some major differences. You won't be able to design the exact size and shape of the rooms in your house, although you can build pre-made rooms and attach them at any point on your house that fits on your plot. There also isn’t the option for building on the second floor. You cannot play many different people at the same time on the same account. The Sims Social does not seem to have a downtown area where you can go to meet people and buy objects at stores. Nor does it have an overall residential map where you can buy bigger plots of land. Instead, you move into better neighborhoods by increasing the value of your house. I haven’t seen any interactions between large numbers of Sims – it just seems to be one on one interactions. Enough about what isn’t there, let’s talk about what IS available in the Sims Social. There is significant character customization – not as much as the Sims 3, but much more than most other Facebook games. You also do pick a basic personality type for your character. You can choose to be Introverted, Money oriented, a Rock Star, and a few others but again not as many as have been available in other Sims titles. All the socializations between Sims seems to be there, almost as many as in any other game which allows for a huge range of interactions between friends and enemies. The interactions also change based on the level of friendship, love or hate. These interactions can be accomplished when you visit another Sims’ house which can be easily done by clicking on their picture. There is a very similar needs system that drives the game. You have to take care of your Sims’ Hunger, Fun, Social, Bathroom, Hygiene, and Sleep or they will be unhappy. Like other Sims versions in the past, when your Sim is completely fulfilled, they will perform at an Inspired level that yields greater rewards for their actions than usual. The game does seem to follow a solve quest, get reward scheme like most other Facebook games which is okay for getting bonus experience, but may slow you down if you are more interested in doing your own thing. All of the skills are now broken down into Music, Art, Writing, and Cooking. Not as many as in other titles, but at least it’s something. 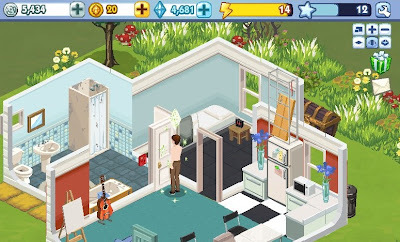 In fact most of the Sims Social seems to be a watered-down version of the Classic Sims games. 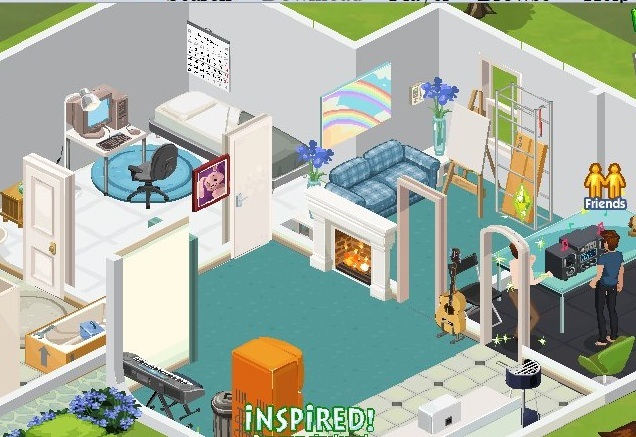 The only other game similar to The Sims on Facebook is Yoville, and that doesn’t come close to the interactions and home design offered in The Sims Social. However, Yoville does have chat capability, common meeting areas and jobs outside of the house. We’ll have to see if The Sims Social tries to expand into these areas in the future. At this point The Sims Social is still in beta and anything could change if enough people request it. So should you play it? 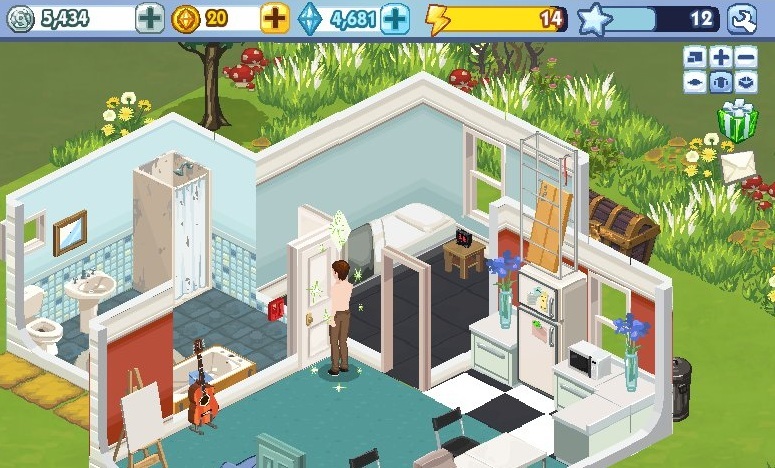 If you are a die hard fan of The Sims, or an addicted Facebook fan – definitely YES! 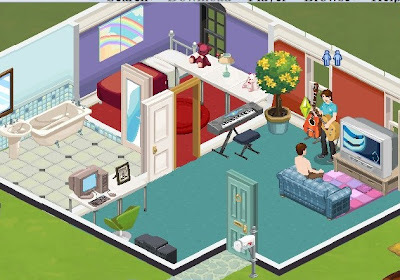 I know that I’ve already had lots of fun making a house, furnishing it, making new friends and checking out their houses, having my Sim fall in love and pulling pranks on my arch-enemy. I do have to say that it takes your Facebook friends and gives them a face, home and personality that you may not have otherwise encountered. 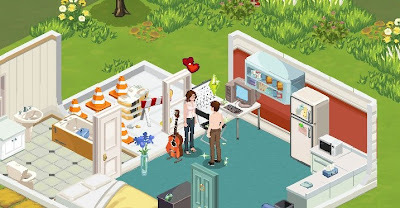 If you never seriously got into The Sims or just use Facebook occasionally The Sims Social probably isn’t for you but it could give you a good reason to join the social media phenomenon. i think that you guys should take away the energy bars because some of us are frustrated with waiting for our energy to go up when we lose it all. another is the "help" thing on the houses. some of us just want to build houses quick and easy. I agree that having certain amounts of energy can be very limiting and can be frustrating to wait for it to regenerate. I don't think this will likely change because they want us to keep coming back to play a little more everyday. As to the "help" thing, that just keeps us advertising requests to non-players and players alike to keep them interested in the game and lure them in if they don't play. When we sign on for something free, there's always a catch.